Patty's Utopia: The Biggest Party of the Year: The 3rd Seattle Annual Tweet Drive! 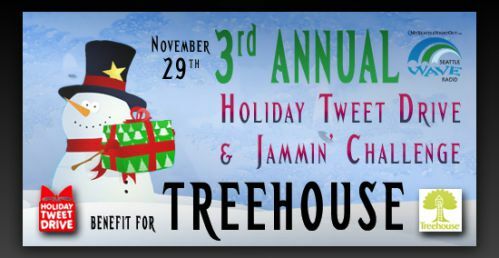 The Biggest Party of the Year: The 3rd Seattle Annual Tweet Drive! Seattleites are known for their generosity and willingness to share with others a little or much of what they have. For that reason it's no surprise that during the Holidays, many events are organized to give to those less fortunate. About 3 years ago, a college student had the vision of having a party to gather toys for unprivileged children for the holidays by using the power of Social Media for Good. That's what the Seattle Tweet Drive is about. Although is now known as "Operation Social Santa." 100% net proceeds benefit Treehouse: Giving foster kids a childhood and a future. Ah, and don't forget, in conjunction with the Seattle Tweet Drive, Seattle WAVE Radio will hold the finale of an 8-week Jammin’ Challenge at 7:45 p.m. This Thursday is all about having fun and bringing smiles to kids in foster care!